The Wednesday morning fire at Olusosun dumpsite in Lagos burnt seven buses belonging to LAGBUS Asset Management Limited. Although no life was lost in the Wednesday morning fire at Olusosun dumpsite in Lagos, LAGBUS Asset Management Limited is counting massive losses. 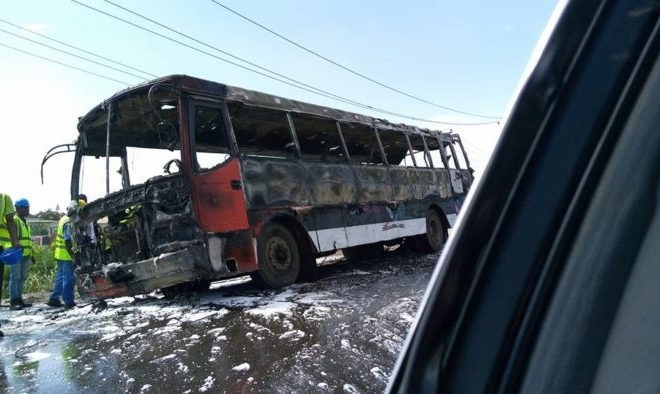 Report has it that the company lost seven buses to the fire. A LAGBUS official, who pleaded anonymity, told NAN on Thursday in Lagos that due to the thick smoke still surrounding the area, the company was yet to make further assessment of losses suffered. The official said that the firm had moved staff away from the area because of the health implications of the smoky environment. According to a NAN correspondent who visited the site, the environment is still very foggy as emergency response teams are seen with nose masks. Commuters at the Toll Gate bus stop near the dumpsite were also seen covering their noses with handkerchiefs and seeking quick exit out of the environment. Mr Adesina Tiamiyu, the General Manager of the Lagos State Emergency Management Agency (LASEMA), said that the emergency response teams, including the Lagos Fire Service and the Lagos Waste Management Authority (LAWMA), were at the site to curtail the fire. The Lagos State Government had said that the Olusosun and other dumpsites would be shut down as part of the Cleaner Lagos Initiative (CLI).